No, user names have to be writte as one word, e.g. "Dancingqueen." 2. "How can I change my password?" Yes, go to MyPage/Settings (make sure you're logged in, otherwise you can't access your MyPage) and you will see where to change your password. Or if you can't log in, you can click here to get a link in email that allows you to choose a new password and log in immediately. 3. "Can I change my user name?" Sorry, user names belonging to an existing account cannot be changed. If anyone finds it easier, they can sign up (register) as a first time user with their Facebook or Google account. It will be a relief for those internet users (like me) who are tired of registering for every new service they try out and prefer to use their social accounts to get into a site with one click. Users can, of course, still sign up with their email address, and for them we made sign-up much easier. It's enough to fill in 4 fields, and that's it. You don't have to type in your password twice as before. The reason for confirming a password is because the letters of the typed in password are turned into dots for security reasons, so you can't see what you're typing. Instead, now you only have to type in your password once, and if you want to check whether you typed it correctly, you can just click on the eye icon on the right of the password field (click it again to turn it back to dots). We also got rid of the former horrible CAPTCHA (anti-bot protection) and replaced it with Google's new user-friendly one where you just have to check in a box saying you're not a robot. You can log into iSLCollective with your Facebook or Google account, which is really simple. 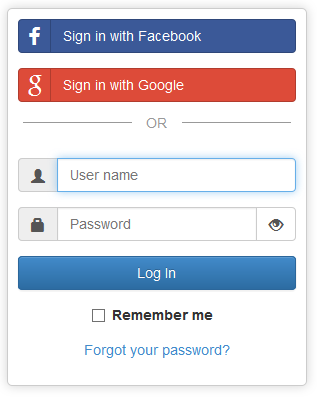 During the first login we'll ask you to connect your existing account with your Facebook or Google account by providing your user name and password. From the second login, it will literally take just one click to get into the site in this way. 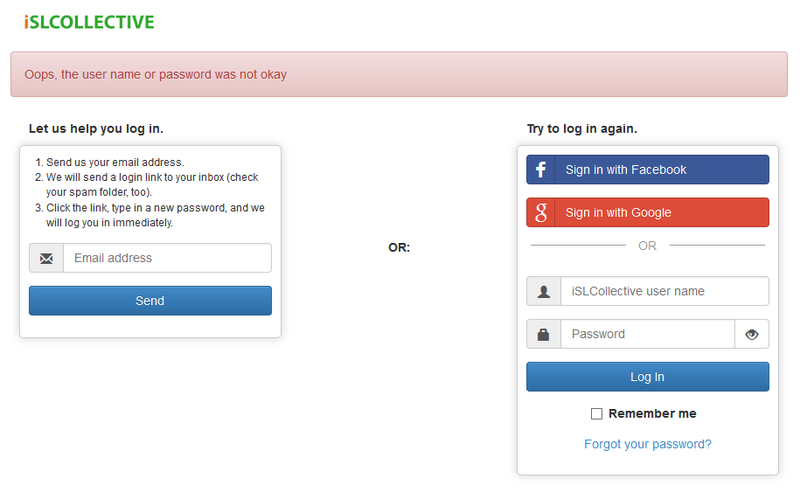 You can still log in with your iSLCollective user name/password combination as usual and it should work fine. If you forgot your password, you can click on the "Forgot your password" link. Then you can tell us your email address (the one that you registered with), and we will email you a link where you can set a new password of your own choosing, and you will get in immediately without our help. If you recall, previously we generated a code for you, but it still didn't get a lot of people into the site, and we got tons of email from desperate users. So this will be a much better solution, since everyone who clicks on the Forgot Password link will get into the site after doing the above simple process. All you need is to find our email in your inbox (please note that emails can sometimes end up in your spam folder, so make sure you also check there). 1. First of all, let's clarify one thing, because not everyone seems to understand this: REGISTER FREE is for first-time users. Anyone who wants to download our worksheets, needs to register (=sign up) here. If you're an existing user you need to click on the much smaller "Login" link. 2. OK, so let's suppose you went to the Login page. You want to log in (=sign in) with your user name and password combo, but can't because some data you entered isn't right. Maybe it's the user name. 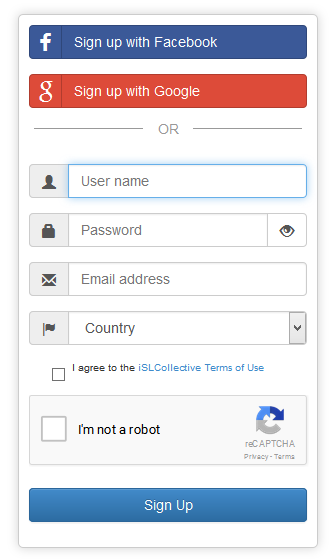 First, think about whether you are really inputting your iSLCollective user name. Some people think they have to input their real name, while others believe their user name is their email address. No. 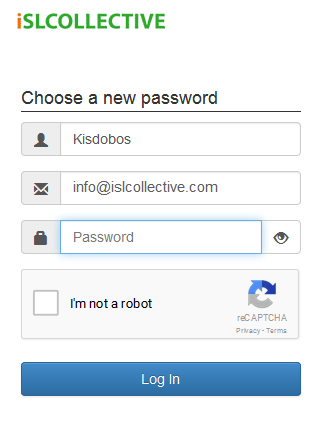 Your user name is your nickname you chose when you registered on iSLCollective, like mine: kisdobos. Maybe it's the password you're getting wrong. Perhaps you've just mistyped it. Click on the eye icon on the right of the password to see what you've typed. 3. If there was a problem with your user name or password, we will load a page where you can try to enter them again, or try to log in with your Facebook or Google account. 5. You click on the link, and it takes you to an iSLCollective page where you can choose and save a new password for yourself. You will see your user name and email address The password has to be minimum 6 characters long, because shorter passwords are weak and can be hacked with powerful computers. We also suggest you use Capital letters and numbers, too. To be on the safe side, I suggest checking what you've typed by clicking on the eye icon. (I'm not gonna help you with what to do with the empty checkbox that says "I'm not a robot" because robots may be reading this. 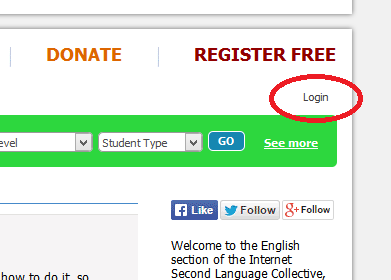 :) Click the blue "Log in" button to save your new password and log in to iSLCollective. If you have trouble logging in or you don't receive a new password email, please don't hesitate to contact our support line at info [at] islcollective [dot] com. 1. "What kind of resources can I find on the site?" Most of our files are MS Word doc and docx files, and a smaller portion are powerpoint files (ppt and pptx). A relatively new format is Teaching tips, which you can type in and share under the CREATE menu. 2. "What kind of resources can I find on the site? "Why are some of the worksheets docx type? Not everybody can open them." We support docx files because a lot of people use the new MS Word, where this is the default format. If you use an older version, try installing the Microsoft Office Compatibility Pack for Word. You can download it for free here. This will surely solve your problem. Or go to zamzar.com where you can convert the docx file into doc format online. 1. "What can I do as a free user?" You can download any of teaching resources you find on the site free of charge, manage your uploads & enjoy everything else that used to be free.As for the etiquette of downloading free, it's nice to say 'Thank you!'. There are real people behind each worksheet who had worked hours to give you what you need for tomorrow's class. I know you might be in a rush but clicking the "Thank you" button or even better, writing a nice comment r detailed recommendation, means a great deal to any author, because it tells us we are appreciated. After 50 consecutive downloads a day, we'll throw up a captcha to stop programs from systematically downloading our complete database (we've had such attempts in the past). 3. "Why should I become a Supporting Member?" We operate the site using the income from Supporting membership fees. This is a great way to say Thank you to our staff and help us continue our mission to provide free language teaching materials this year. In return for supporting us, you will see no ads during your Supporting membership period. 4. "Is it safe to pay on your site?" Yes, it is as safe as it gets. 5. What is the payment process with PayPal? You select your Supporting Membership period on the fundraiser page, and click on the Paypal button. On the next page you have to choose whether you need a detailed invoice or not (if you check in this box, some new fields will show up and you’ll be asked to provide your personal details so we can make out your invoice). There is another checkbox that says “Please publish my name on the public list of supporting members.” If you check in that box, your name will be listed on the list, and the caption "Supporting member" will be shown above your large size avatar. If you click on the “Pay now” button, you will be redirected to PayPal's secure site to make the payment. There you need to log in to your PayPal account, or if you don’t have one, provide your bank card details. Once your amount arrives to the iSLCollective bank account (it’s typically a matter of max half a minute), your iSLCollective account will be automatically upgraded to a Supporting Member account, and you will no longer see ads on the site. 6. "Can I pay via Western Union?" Sorry, no. You can pay with PayPal or your debit/credit card. Our payment partner for the latter is CCBill.com. 8. "Can I get a refund if I don't like the Supporting Membership?" 9. "You said that I can get priority support if I have a technical problem. How can I contact you?" Please go to your MyPage/History-support and write to us using the contact field there. On weekdays, Supporting Members are entitled to priority support, meaning that we will respond within 24 hours of receiving your mail. If you contact us on Friday, we may get back to you on the next Monday. 1. "What can I upload?" The key rule is: only upload material that YOU CREATED YOURSELF! Do not upload entire pages, images, or any text from other ESL websites or print publications (course books, grammar books, resource books). Also, please read our upload rules carefully to understand all the rules. 2. "What is the upper size limit?" The largest doc file you can upload is 2 megabytes, the largest ppt can be 25 MB. 3. "What if my file is larger than that?" If you have a larger file, you could decrease the file size by shrinking the images in the document with a photo editor. The only formats we can currently handle are .doc/docx and ppt/pptx (Microsoft Word and Powerpoint). If you have your file in some other format, you can capture its content by opening the document, then hitting the printscreen button on your keyboard and copypasting the image into an MS Word or Powerpoint document. 4. "I can't upload. Am I doing something wrong?" If you have problems uploading your worksheets or find any bugs, please write to me (Kisdobos) on the site and we will do our best to fix it as soon as possible. 5. "How can I edit or resend my worksheet?" Go to your worksheet's own page (make sure you're logged in) and click the "Edit worksheet" button on the resource page on the left of the Download button. Clicking takes you to another page (the Edit page) where you can edit the tags of the worksheet. Make sure to save the changes by clicking on the "Save" button at the bottom of the Edit page. You can also resend an updated version of your file (find it at the bottom of the Edit page: "Resubmit"). 6. "Which worksheet becomes the Worksheet of the Day?" The Worksheet of the Day algorithm: The sytem looks at the uploads of the previous two days, and the most downloaded one becomes Worksheet of the Day.